We are totally with you man. We know. That cop planted all those drugs. And the gun. And all that stolen money. And hey, there was only one body. Clearly you didn’t do it. Haven't you heard? Everybody on the inside is innocent. Lawyers man, what good are they? Useless jerks. Okay, so there was no drugs. There was no gun. There wasn't even a dead body. Probably wasn’t even a cop. The stolen money on the other hand...wasn't real either. But it all sounds so adventurous. So thrilling. Until you get caught. But then again, that's just another kind of dangerous. Another situation to prove you can rise to the top in. You can be the biggest, baddest, guy in lock-up. This Halloween you can show the kind of top dog you are on the inside, all without having to commit a single crime. 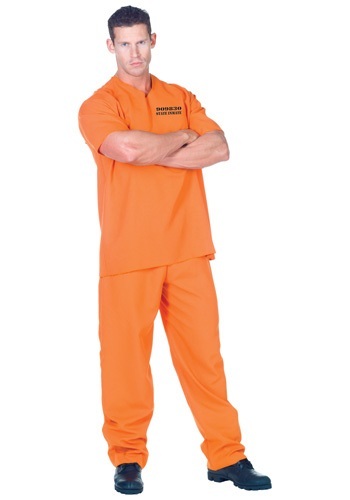 Just put on this Public Offender Inmate Costume, and embrace your dangerous side. (At least for the night.) You won't have to do any real hard time to get this inmate outfit. You won't have to have any drugs, a gun, money from the bank, or a dead body. All you'll have to do is hit the 'Add to Cart' button. Then voila. You will be telling stories of how your lawyer got you locked up, just like all the other schmucks in the joint. You have the right to an attorney. Who will still mess up your case, getting you sent to the big house.